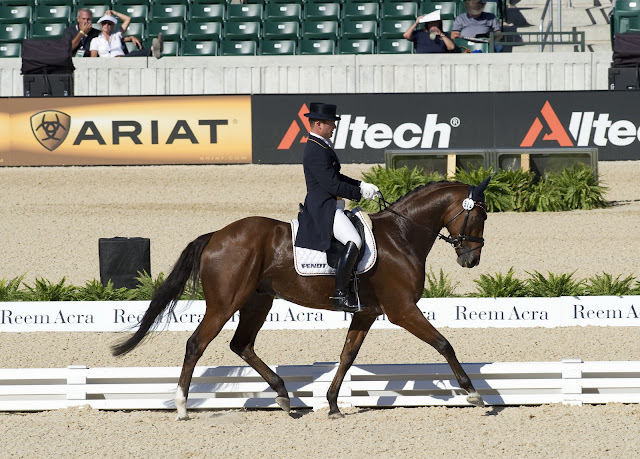 The German team go into tomorrow's Eventing Championship cross-country challenge at the Alltech FEI World Equestrian Games™ with a 14 point lead over their nearest rivals from Great Britain. Sweden lies third ahead of Australia in fourth but less than 20 penalties separate the top four nations and just 40 penalties, or two jumping errors, separate the top ten teams. On a day when the standard of dressage just kept getting better and better it was Germany's Michael Jung who took over at the head of affairs. He admitted during the post-competition press conference that he regularly competes in pure dressage - "but not at the World Equestrian Games!" he pointed out. He described his 10 year old gelding La Biosthetique Sam as "a bundle of energy", and he used that energy today to post a superb score of 33.0 to go out in front. However he is closely followed by Italy's Stefano Brecciaroli whose test with Apollo van de Wendi Kur Hoeve brought a rousing cheer from the crowd after they put 35.50 on the board. 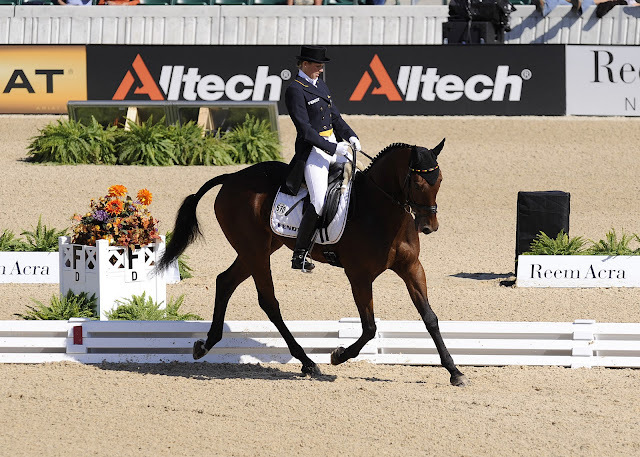 The handsome Belgian Warmblood gelding, which the rider has been competing for the last two years, really rose to the occasion and the 36 year old rider from Rome, who is a member of the Italian police force, the Carabinieri, was delighted with his result. "I competed in Fontainebleau (FEI European Championships) last year and also in Aachen this summer with this horse" he explained. First-day dressage leader, Germany's Simone Deitermann (Free Easy NRW) was relegated to third but with Andreas Dibowski (Euroridings Butts Leon) in seventh, Ingrid Klimke (FRH Butts Abraxxas) in 11th and final team-member Dirk Schrade (Gadget de la Cere) in 13th, the Germans are firmly in the driving seat ahead of cross-country day. Fourth slot today went to Gazelle de la Brasserie and Belgian rider, Karin Donckers, who broke her arm just three weeks ago. Donckers was bringing two four-year old horses in from a field and when the two friends were separated they weren't happy. The horse she was holding stepped on her foot and then knocked her over. "I fell backwards and put out my arm and broke it" she explained. Despite the setback however, and thanks to the help of her trainer who rode the horse while she was out of action, she scored 38.80 today. Talking about Gazelle she said "I've been riding her for five or six years now and I can always count on her. She's had a lot of good results - in Hong Kong she did a good test and at Fontainebleau last year also" she added. 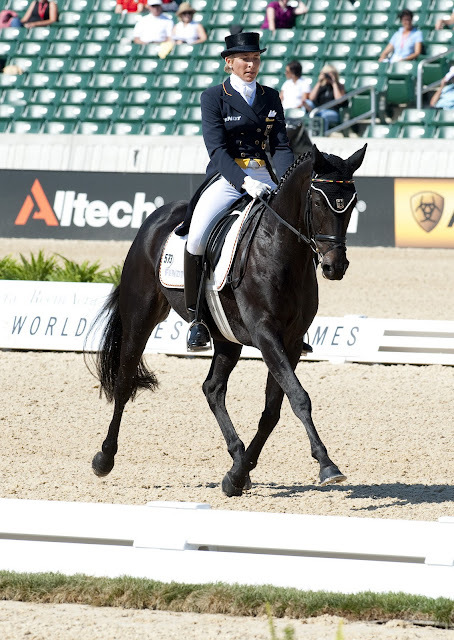 The host country holds fifth spot following a lovely test from Rebecca Holder and Courageous Comet while Sweden's Niklas Lindback and Mister Pooh are in sixth place. Best of the British is Tina Cook who steered Miners Frolic into eighth and there is little separating the top ten individually, with the leader, Jung, on a score of 33.0 and New Zealand's Andrew Nicholson (Nereo), last man into the ring today, in 14th place carrying 43.50. The most unlucky rider of the day was Karim Florent Laghouagh from France who made it all the way to the end of his test with Havenir d'Azac before being disqualified for blood in his horse's mouth. Ground Jury President, Marilyn Payne, explained that "when he started his test we didn't see it but in the middle of his test we saw a little pink. When he passed the judges we could see it was getting worse but we let him finish. It was a hard thing to do, but we must go by the rules", she said. She was full of praise for the standard of the work she saw today. "It is very exciting but a bit nerve-wracking when they just keep getting better and better - I gave you a 10!" she said to Stefano Brecciaroli, "it was for rein-back - it was flawless and he walked forward in a long, lovely walk" she added. "When Michael came in it was 8,8,8 - his test was so consistent, it was such a pleasure to watch" Ms Payne concluded. All the riders are really looking forward to tomorrow's cross-country. Jung said "it is difficult from beginning to end, very big jumps and the longest cross-country I've ever done. The course is up and down and you have to pace your whole trip". Breccarioli said "there are a lot of questions on the course and big jumps. There are two big drops into water and I think at fence 25 it will be a big effort for your horse if he is tired".